"Designed to perform throughout mixed mountain terrain, the Power Mix Pants are all about high-alpine adventures, offering breathable and durable protection for your bottom half while trekking through mountain valleys and scrambling up alpine summits. Full-stretch soft shell fabrics are paneled to maximize the performance of each, while the slim alpine fit and articulated knees ensure efficient mobility. Ergonomic build to maximize scope of leg movement plus comfort. 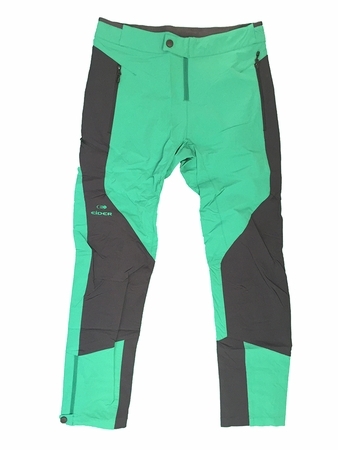 Thanks to reinforced cuffs, your pant better resists abrasion and rubbing by your ski edges. The first barrier against rain, whether your jacket includes a membrane or not. It stops the outer fabric from becoming water-saturated. And withstands numerous wash cycles. SOFTSHELL LIGHT 4 WAY STRETCH // UPF 50+ // 88% POLYAMIDE 6% ELASTANE SOFTSHELL 4 WAY STRETCH DOBBY // UPF 50+ // 88% POLYAMIDE 6% ELASTANE"